SCHURTER have introduced the 4761/4762 series of waterproof IEC connectors designed for harsh environments. The connectors are waterproof to IP67 (mated) and IP69K (un-mated) standards and are available as panel mount inlet sockets and re-wireable cable mount plugs. The 4761/4762 series connectors are IP67 rated when mated together and IP69K rated when in the un-mated state and the optional captive protection covers are fitted. The connectors are rated at 10A / 250V AC (IEC) and 15A / 250V AC (UL) and have an allowable operating temperature from -25°C to +120°C. The connectors are available in black or white colour and are constructed from UL94V-0 rated thermoplastic, they feature a push/pull locking system integrated into the connectors so no additional accessories are required, the locking feature automatically engages as the connectors are pushed together and is disconnected by the user pulling the body of the cable mounted plug which slides back to release the locking mechanism. The locking system prevents unintended disconnection, this feature is particularly useful where the equipment is installed in an environment where cables may get snagged causing accidental connection. The panel mount inlet sockets are design for use in panels up to 6mm thickness and can be specified with solder or quick connect terminals, the cable mount plugs accept cables from 6 to 10mm diameter and wire gauges from 0.75 to 1.5mm2. The cable plugs can be user wired and feature screw connections allowing fast and reliable assembly. 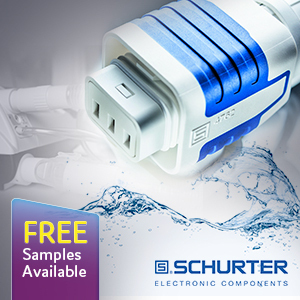 Anglia are offering customers FREE samples of the 4761/4762 series of locking waterproof IEC connectors from SCHURTER, please fill in the form below to register for your FREE samples now.